Last Sunday I knew my hand/arm/shoulder was a little sore but I just wanted to finish off a small bag I was making. Then in the afternoon I tackled the garden, pulling out some persistent weeds and used the pruning saw to remove a couple of shrubs that didn't survive last summer. Monday I promised myself I would take it easy but unfinished patterns beckoned and I worked on the computer for most of the day. 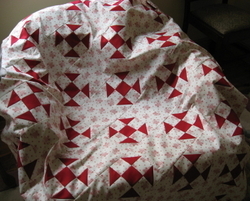 Tuesday I finished the backing for the new red and white quilt and dropped this and another quilt off to Susan Campbell (Rowdy Flat Quilting). 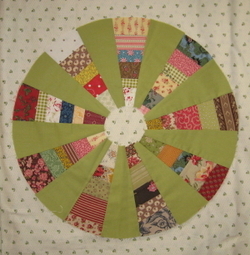 Susan was working on a button hole appliqued quilt and took time to show me how she custom quilts the blocks. She made it look incredibly easy. No marking, just freehand. In the afternoon I did a little punch needle hoping to finish another sample. On Wednesday I went for a massage (was lucky to get a cancellation when I rang). Last time my arm/shoulder was sore I needed many weekly, followed by fortnightly, then monthly visits before it came good. It doesn't mean I stop sewing altogether. I make sure I spend only short periods hand sewing, before switching to the machine to rotary cutting to housework (yes I will even clean the bathroom just so I'm working different muscles) back to hand sewing or punch needle. And I become more diligent with my excercise routine - supposed to stop and do them every 10 minutes (or is it 5?). Was I good yesterday and rest my arm? NO! I'm still in this finishing off mood. This is pretty rare for me, so when it comes along I have to make the most of it. I made the backing for a quilt, a bit tricky because I hadn't purchased enough fabric and had to add a strip, binding for four quilts and sewed the binding on two. Don't know when I'll be able to hand sew it down. I needed fabric to bind one of the quilts and couldn't decide if I would go to the shop or not. Was thinking if I don't do it today who knows when I'll get around to it. I didn't waste valuable time 'tidying myself up' and tried to sneak into the shop without anyone seeing me. Opened the door and walked into Sue-Anne and Michelle. Should have known I'd get caught! I couldn't resist a few other pieces while I was there. 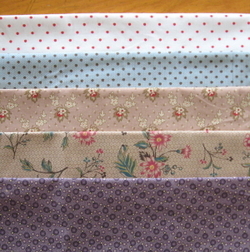 No plans for these fabrics other than the purple. There are some wonderful spots around at the moment. 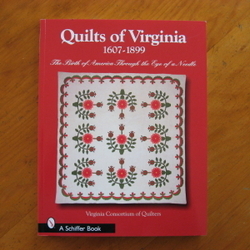 The binding fabric is red and was already on the quilt when I realised I should have taken a photo. Sorry, I'll show you when the quilt's finished. The plan for today was to type this post and then take my time looking through the new book that arrived in the mail today. The days almost over and all I've managed is a quick tantalising peak. There was little sewing done over the weekend. Friday morning I heard our dog whimpering and went outside to find him. I couldn't see him anywhere. While I'd been working inside, starting new projects and finishing off old ones, the weeds had taken over the backyard. It's embarrassing to admit how big the mountains of weeds were, but the plan is to have them under control by the end of the week. The fun part about designing is playing with fabrics and thread. The not so fun part is writing the patterns, which is what I've been working on today. Here are two of my new Christmas projects. Christmas decorations are what I love to make most of all. I think Christmas all year round and start putting up the decorations early and take them down late. 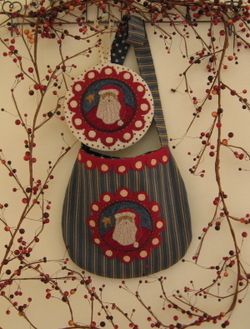 This is St Nick a punch needle project. The pattern is almost finished. Christmas decorations make wonderful gifts. It's not always possible to use or display gifts all year round. And just because we love something doesn't mean the next person does. 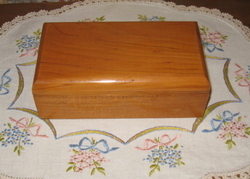 A Christmas decoration can be stored away for most of the year. 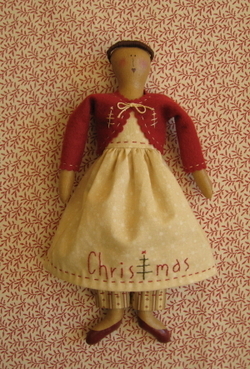 This is Christmas Belle a painted cloth doll. The pattern will be available early November once the classes are finished. Please email me if you are interested in class details. I should mention the dog is OK. He had put his head through the mesh fence trying to reach the sausages and bread the neighbour had thrown out for the birds and got stuck. Well, if he eats fabric, he's not going to let a fence get in the way of real food! I came to a decision last Saturday to finish some quilts. So this week in between working on the projects for workshops in November I made a start. 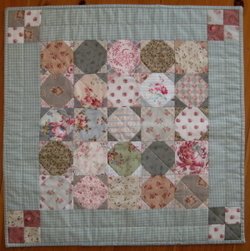 Some time last year I purchased a really gorgeous charm pack and made this little quilt. The top was finished, the binding made and the backing fabric purchased all I had to do was quilt and bind it. I'm a little embarassed to admit how long this has taken me do. 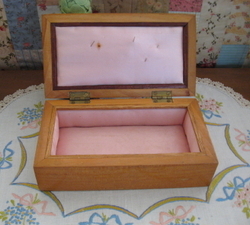 I finished stitching the binding down at sewing today. The plan is to finish a second little quilt by tomorrow because if I put it back in the cupboard who knows how long it will be before I take it out again. Now I wish I could say this was mine, but it's Jan's. 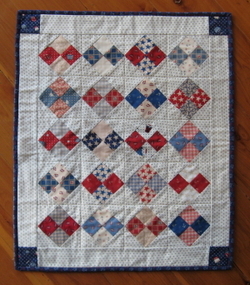 This is just one of nine string pieced blocks. They just need to be appliqued down and the top will be finished. The consensus at sewing today was this will be a beautiful quilt. Now I have never really liked the colour red. Maybe this is because as a child I had light auburn hair and red was not the best of colour choices for me. For me, red was a colour you decorated with at Christmas. When I worked the redwork stitcheries made so popular by Wendy Brigg, I used country colours. Now I am not sure how it happened but I think it goes like this. I made a basket lattice quilt out of scrap fabrics and enjoyed making the quilt so much (loved the fact that when you join in the last piece the quilt top is finished) that I thought I'd make another one. But I didn't want it to be the same. 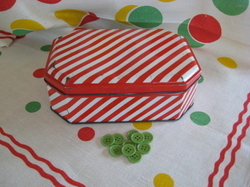 I had lots of red scraps left over from doll making (Christmas) etc, so I decided to use them up. This was the start, now I love the colour red, everything looks good in red. I even bought a little red T shirt last summer. 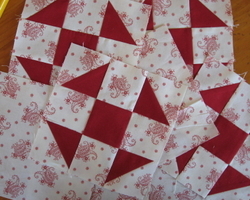 Last year Jan and I decide to have a red theme for Christmas and got together and each made a strippy quilt. 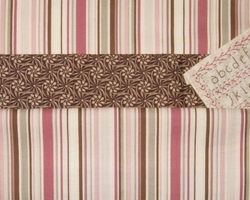 We drafted up a pattern, bought the fabric, then changed our minds about the strip widths. This changed everything. There we were thinking we would get it cut out in a day and instead, we were driving to Wangaratta for more fabric. 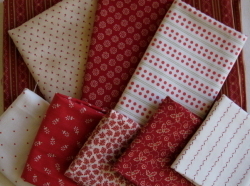 Now when I buy fabric I head straight for the reds. 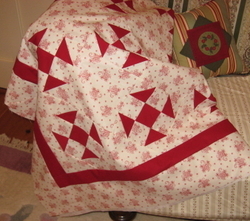 I am going to make another red quilt this year. The plan was to start today and have one block made. But other things got in the way, so it looks like Saturday now! At the Melbourne Craft and Quilt Fair I picked up the book 'Were Women Create' by Jo Packham. The following day I spent a leisurely couple of hours browsing through the book soaking up some truly inspirational work spaces. Now I don't have a sewing room. I could if I wanted to, but I love to sew at the table in the family room. The room has views of the garden and it's bright and warm on sunny winter days. Now that spring is here the temptation to slip outside with a cup of tea or coffee and a stitchery or punch needle project is strong. And I do give in. A little time spent outside is very good for the soul. 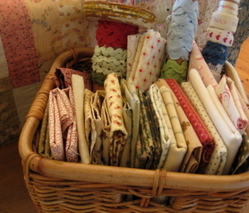 Scattered around the room are small baskets and the like filled with fabrics and trims. My dear friend Jan, she's the one responsible for getting me started on blogs, has a lovely craft room. Jan has just finished joing the jelly rolls into strips. Don't they look great hanging off the clothes rack? 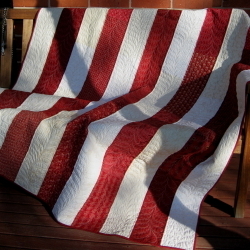 Now all we need is a photo of the finished quilt.